Walking slowly not only burns more calories per mile, but it may also save wear and tear on the joints of those who are obese. With increasing interest in slow walking with a treadmill desk, walkers want to know whether they are getting any benefit. Researchers at the University of Colorado at Boulder confirmed that people burn more calories per mile walking a very leisurely 2 miles per hour than walking a moderate to brisk 3 to 4 miles per hour. Researcher Ray Browning also noted a surprise finding, that obese people have modified their body movement so that they are energy-efficient walkers. While they burn more calories per mile due to moving more weight over that distance, the calories burned per pound of body weight was similar to lean people. More good news is that strolling slower also reduces the loads on the knee joints by 25 percent. This can be an important factor as obese people take up an exercise program to burn calories while reducing the risk of injury. 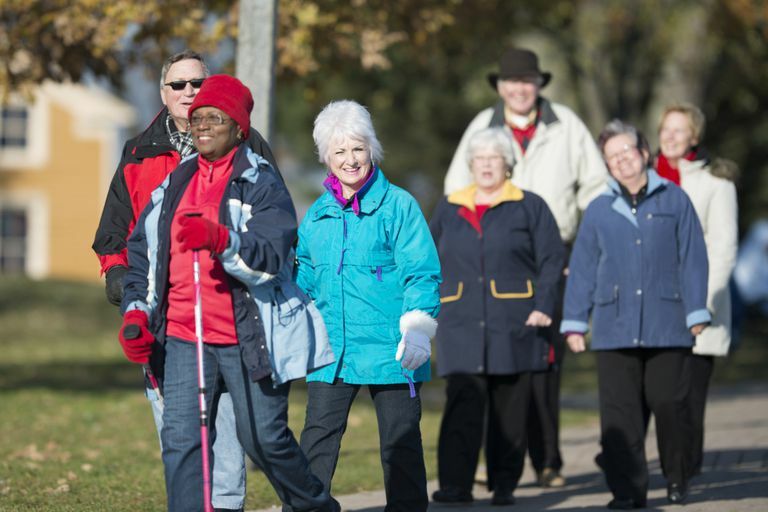 "The message is that by walking more slowly, obese individuals can burn more calories per mile and may reduce the risk of arthritis or joint injury," said Ray Browning in a press release. Walking with fitness poles has a similar effect, it burns more calories per mile while taking pressure off of the knees and joints. If you want to raise your heart rate into the moderate-intensity zone but have difficulty doing it at your usual walking speed, adding poles may be the answer. Slower walking has a drawback; it doesn't give the aerobic training effect produced by walking fast enough to raise the heart rate into the moderate-to-vigorous intensity zone recommended to lower health risks. Browning recommends adding other vigorous-intensity lower-impact activities like swimming, cycling, step routines, and elliptical training workouts. Why Do You Burn More Calories at Low Speed? At low speeds, you lose the efficiency of already being in motion—momentum, as one step is the springboard to the next step. This makes your muscles work a little harder with each step. You are not an efficient walking machine when you are walking at less than the natural stride rate. You can see from research into metabolic equivalents, measuring how much energy was actually expended at different walking speeds per minute. In real life, you can discover a pace where you feel most comfortable and like you can walk easier and longer. That is your natural pace. Forcing yourself to walk slower or faster will feel unnatural. If you want to speed up, do so gradually and for just a few minutes at a time at first. Browning R. "Energetic cost and preferred speed of walking in obese vs. normal weight women." Obesity Research, May 2005; vol 13: pp 891-899. Ainsworth BE, Haskell WL, Herrmann SD, et al. 2011 Compendium of Physical Activities. Medicine & Science in Sports & Exercise. 2011;43(8):1575-1581. doi:10.1249/mss.0b013e31821ece12. Do You Burn More Calories by Walking Uphill? Are You Walking in the Fat-Burning Zone?